Tyler Pharris is a senior Mechanical Engineering major from San Antonio. Tyler is an active member of ASME and has a passion for aerospace engineering and fluid mechanics. Q: How did you get involved with ASME? What is the benefit of joining ASME? A: I joined the organization in my sophomore year, and I have been an active member ever since. 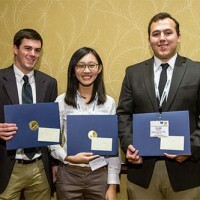 ASME provides a lot of opportunities for students to network with alumni and industry professionals. Therefore, if you want to get a head start on your career, ASME is a great organization to be a part of. The officers will bring in industry speakers for recruiting, networking, and informational sessions about once or twice a month. ASME also provides a lot of training opportunities for members. The officers or industry professionals will teach students how to write resumes, help them start job applications, and tell them what the company is looking for in new hires. ASME gives students a lot of opportunities to help them advance their careers before they actually get into their careers. They also have fun activities where students get to meet and network with a lot of their classmates, especially younger classmates who you won’t meet in your upper-level classes. Overall, ASME provides a lot of opportunities that you won’t find elsewhere. Q: How did you learn about the Old Guard Competitions? A: I heard about the Old Guard Competitions in the first ASME meeting of the spring 2015 semester. ASME officers were trying to gauge what activities the members were interested in by sending out petitions. The ASME faculty advisor, Dr. Van Treuren, wanted to send a group of student researchers to present their research at the Old Guard Competitions. In order to attend the Old Guard Competition you had to have a research project or a design project that you were currently working on. At that time, I had been working with Dr. Van Treuren for a few months on research focusing on airflow in low-pressure turbines when at high-altitude cruise conditions. Because of our work, Dr. Van Treuren felt like I could be competitive in the competition and encouraged me to go. Q: What is your research focus and how did you get interested in your area of research? A: My parents are both retired Air Force and my dad now works in the airline industry. As a result, I have lived all over the world and spent my entire life having airplanes fly over my head. Because of these experiences, the aerospace industry was really just a next step and natural fit for me. After high school, I was torn between studying to be a doctor or an aerospace engineer. At the time, Baylor was the only option that gave me the flexibility to pursue both. I took classes in the pre-medicine track up until the end of my junior year, when I began working with Dr. Van Treuren. Before I decided to come to Baylor, I attended Invitation to Excellence (I2E), and I met Dr. Van Treuren. During my first two years at Baylor, Dr. Van Treuren was on sabbatical, so I didn’t have an opportunity to work with him. At the beginning of my junior year, I met him again at the STEM Job Fair, and I remembered him from I2E. I asked him if I could work on a research project with him, and he showed me around some of the facilities in Rogers. When Dr. Van Treuren showed me the cascade he told me, at that time, the wind tunnel hadn’t been used in about four years but the research it could conduct was still important. I was interested in the research and I liked the challenge of taking an inoperable wind tunnel and bringing it up to a research-qualified wind tunnel. I thought it could be a project that I could work on from the ground up and test my skills on. My research focuses on the low-pressure turbine in jet engines, particularly when flying at high-altitude cruise. Engine manufacturers are always trying to make their engines more efficient and a lot of research, including my own, is focused on this goal. Previous research has shown that there is a significant decrease in the efficiencies between an engine operating at low altitudes and an engine operating at high altitudes. This is mainly due to a decrease in the air density as the engine rises in altitude. This decrease in air density results in a phenomena called flow separation occurring in the low-pressure turbine. This is because, when you’re at altitude and you’re getting low momentum flow, air will separate from the blade. This separation of air will create a lot of inefficiencies in the engine. Our research not only looks at learning more about flow separation, but also ways to fix it. After reproducing a similar research experiment and finding the same results, the wind tunnel is now research-qualified. Through my research on the cascade we have also published an awarded technical paper and are in the review process for our second paper. At the beginning of this year, I decided that I wanted to pursue aerospace more than I wanted to pursue medicine so I dropped pre-med. My experience with research helped me make that decision. Q: What ASME Competitions did you participate in? A: I participated in the Old Guard Oral Presentation. The Oral Presentation is a two-stage competition. For the first stage, the student competitors from several universities in ASME District E presented at a Student Professional Development Conference (SPDC) hosted by Texas Tech. After I won that competition, I was invited to the International Mechanical Engineering Congress & Exposition (IMECE) in Houston to do the same oral presentation. I made some minor adjustments to my presentation, but I presented on the same topic. I competed against the top 12 students from across the globe (5 from the U.S. and 7 from other countries) at ASME’s IMECE for the International Competition. I was one of the few remaining undergraduate students at the international level. The practice and improvements paid off, and I won first place at the International Competition. All of the presenters were very good, so I was very excited to win. People have heard of Baylor, but the mechanical engineering program has not received the attention that it deserves. Getting to represent the department was really great. The ME department has more opportunities available for students than many other universities and I was fortunate to get to be involved in both research and the Old Guard Competition. The competition and conference were very fun events and a great opportunity for networking. I won $2000 and an award certificate, but the real prize was getting to meet with some of the chief engineers at different companies and the opportunity to represent a department which has been so instrumental in my education. I also competed in the ASME Young Engineer Paper (YEP) Competition with my research partner, Olivia Hirst. Olivia and I co-authored a paper on our research, which we presented at IMECE. We won third place for our research paper. In addition, Olivia won first place for the Old Guard Poster Competition at the SPDC. It was great to be able to represent Baylor so well at these events. Q: What has been the best part of doing research and studying mechanical engineering at Baylor? A: The best part of being at Baylor is the experience that I have gained. After graduation, most engineers will all have the same degree, but not all of them will have the range of experiences that are available to you at Baylor. One of the best things about Baylor’s program is that it is small. You may not have as much funding as a larger program, but you get much more faculty involvement as an undergraduate at Baylor. The fact that I’ve worked with a faculty member on research for two years as an undergraduate is really rare, but at Baylor it’s common. In larger programs, there may be three or four graduate students between an undergraduate and the faculty advisor. Currently at Baylor, there are many projects available for undergraduates, which is a huge opportunity for students that want to get involved with research. Not only do I get to work on my own research project in the lab, running equipment, running tests, and publishing papers, but I also get a say in what to do next. My resume would be the same as everyone else’s if it weren’t for that extra bump provided by research. When I was applying for my internship at NASA, my experience working with Dr. Van Treuren on the wind tunnel was what got me hired. When an employer sees "Research Assistant" on your resume along with a published paper that is definitely something that is going to stand out. Q: What advice would you give to younger classmates that are looking to gain valuable experience? A: At the beginning of your first year, try out several organizations and see what you like. When you find one that you really enjoy, stick with it throughout your college career. Work your way up into an officer position and seek out different leadership roles in one student organization rather than trying to be minimally involved in several different organizations. Take your classes seriously, especially your math classes. Everything that you do as a junior and senior builds on what you learned as a freshmen and sophomore. The skills you learn in your first and second year will be needed in your upper-level courses and projects. Don’t just memorize the information. Take the time to learn it. Build a good foundation, and you’ll be thankful you took that extra time when you’re working on capstone projects and upper-level labs. As a freshmen, very few companies want to offer you an internship, mainly because you don’t have a lot of experience. During this time, find internships at smaller companies, which need help and can offer you this experience. This gives you an opportunity to learn about the field, provides a great experience, recommendation letters, and ultimately resources. Then, when you’re a junior and senior, you’ll be able to find an internship at a larger company. Don’t be afraid to apply for internships during the semester. Everyone applies for summer internships, but don’t be afraid to take on an internship during the semester and take the extra time to gain experience. A: After graduation, I’d like to get my M.S.M.E. with the end goal of receiving a Ph.D. and working in research and development at one of the national laboratories like Sandia or NASA. I’d like to focus on hypersonics or turbomachinery flow in my research. I feel like a lot of research is headed in this direction, and I’d like be heavily involved in this field. After I get some experience with research development in industry, I may have an interest in teaching. It’s a great opportunity to pass on my knowledge to those who are younger than me, and it’s a great advantage to having a Ph.D.
Q: What kind of soft skills are important for students to cultivate? What can they do as an undergraduate to cultivate those skills? A: Social Skills - There are very few engineering jobs where you won’t work on a team with other people, possibly a lot of other people. Being able to work with a team is an incredibly important, and marketable, skill. Job interviews will focus on your experience working on teams and many hiring decisions will be determined by those experiences. Take the time and work with others on group projects, lead study groups, and join a student organization. Always try to find new ways to build your social skills. They are a valuable asset in our field. Public Speaking - You’re going to have to give a lot of presentations in your career so it’s very important that you practice in college. Public speaking is hard. Even the best public speakers get nervous. Joining clubs and organizations that provide public speaking opportunities will be very beneficial in your future career. Go to career fairs as freshmen and sophomores to gain experience talking with hiring managers and recruiters. Most companies won’t offer you positions as a freshman, but it gives you practice for when you have to introduce yourself at career fairs in the future. Play Sports - Join an intramural sports team. Playing sports shows others that you are a well-rounded individual. It also shows that you have experience working on teams, and it shows that you can take on activities that you aren’t used to doing. Challenge Yourself - It may not necessarily show on paper, but challenging yourself will make you a better person in all fields. The growth that you get from facing challenges will come through in interviews, internships, and eventually in your career.